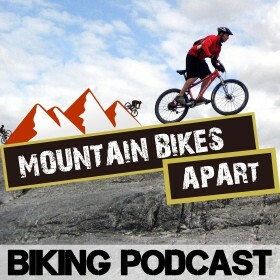 In this episode in our beginner mountain bike series on the Mountain Bikes Apart podcast, Colin and I talk about MTB wheels and the many variations that are now available. Wheels are obviously a huge component of any bike, and now there are more choices than ever before, so it can get pretty confusing! We discuss what the different sizes are, what type of rider each one suits and some setup tips to help you get the most from whichever wheelset you choose. MTB wheels used to be so simple. There was only ever one standard, and that was 26inch. In 2016 though, there’s a whole lot more to choose from. In the first part of the show, we discuss the different options available and some of their pros and cons. Generally speaking, the smaller wheels will be lighter weight and accelerate quickly, which is a positive for all kinds of racing and fast riding. However, bigger wheels like 29er’s hold momentum better once they are up to speed. They also come into their own over rough terrain, making bumps smaller and helping to carry speed. The 27.5inch or 650B wheel sits, somewhere in the middle, and is used by downhillers, as well as shorter XC racers. Aside from these more mainstream wheel sizes, there’s also been a sharp rise in the popularity of plus-sized and fat bike wheels. Fat bikes tend to have a 29er size, but with an extremely high volume, fat tyre, where as plus-sized wheels come in both 27.5 and 29er formats and typically have a tyre width of around 3 inches. They’re both used to offer greatly improved grip on muddy and snowy trails. Once you’re set on your wheel size, there are plenty of others components to tweak and setup decisions to make! The first of these is the rims that you’ll use. Some of the key players in the rim market are Stan’s NoTubes, Mavic, and Shimano, as well as some specialist carbon rim producers such as Light Bicycle and Enve. Aluminium rims offer a great package for riders wanting a lightweight, reliable and no-fuss approach to their rims. Carbon rims offer improved torsional strength, lighter weight and better vibration dampening than aluminium, but aren’t always as resistant to heavy rock impacts, so it’s a case of choosing a rim based on the type of riding you do. Perhaps the biggest decision you’ll make in your wheel setup is whether to run tubes or go tubeless. In the past, as we discuss, tubeless arrangements used to be a bit of a bodge, and weren’t particularly reliable. Now though, most rims on the market are tubeless-ready, and you don’t even have to run a specific tyre to have a solid tubeless setup. Tubeless offers a number of advantages like increased grip from the ability to run tyres at lower pressures, and reduced punctures, as tubeless setups essentially get rid of pinch flats. Both Colin and I agree that when it comes to choosing what wheel setup to go for, you should look at the type of rider you are and what type of riding you do. If you’re a very tall rider for instance, 29er wheels are likely to be better proportioned for your size, whereas a shorter rider may want to opt for a 650B. Similarly, if you’re someone who rides a lot in the winter time and need a bike that will be a true go-anywhere machine, a plus-size wheeled bike might be the way to go, whereas those who ride mostly in the summer will be absolutely fine with a regular MTB wheelset. Both myself and Colin are eager to try a 29er, and will report back with our first impressions as soon as we do! If you’re a regular on one of the new wheel sizes, please get in touch and let us know about your experiences. You can email us through the website or hit us up on Twitter, where Colin is @colinmcgray and I’m @bytombell. Geoff, it’s a good question! Not something I think either Tom or I have much experience in, but I bet we can find an expert to talk it through. What exactly do you want to know about them? Is it the brands that are best to start with, or otherwise? Enjoying the podcast, stumbled across it when searching for bike info etc. about to buy my first bike. I’ve not yet caught up with all your podcasts yet so apologise if it something you have already covered my questions. I’m in my 40’s and will be just riding locally, my last bike was in the 80’s bmx craze! First question, what sort of tyres will be best. At the moment I’m riding my sons bike that has big knobbly ones. Terrain is a mix of forestry commission compacted gravel type paths, some basic mtb trails built by the FC and plenty of tarmac paths too. Bikes I’m looking at are the 27.5″ wheel size. I’m just riding to keep fit, don’t see myself becoming a real mtb rider. on his bike, there’s 2. Some of the bikes I’m looking at at the higher end of my budget only have a single front ring, will that function in the same way as the way I’m riding now? Maybe I should be using both? There are some climbs where I’m riding that put pressure on me but in a good way.